Founder and Managing Partner at Głuchowski Siemiątkowski Zwara i Partnerzy, Marek holds a PhD in Law. He graduated from law, and later defended his doctoral thesis at the Faculty of Law and Administration of the University of Gdańsk. Marek completed his judicial exam and subsequently obtained the qualifications of a legal adviser. For many years he was a research and didactic worker at the Department of Commercial and International Private Law at the University of Gdansk. He specialises in commercial law and issues pertaining to commercial trading, pertaining to public and civil law. Marek largely deals with issues regarding the activity of financial institutions (banks, insurers, investment funds) and their organisational transformations as well as issues regarding financial instruments, capital structuring and securing entrepreneurs in regard to commercial risk exposure. His pracitce also includes matters related to corporate advisory, restructuring, privatisation, energy sector and international investments. 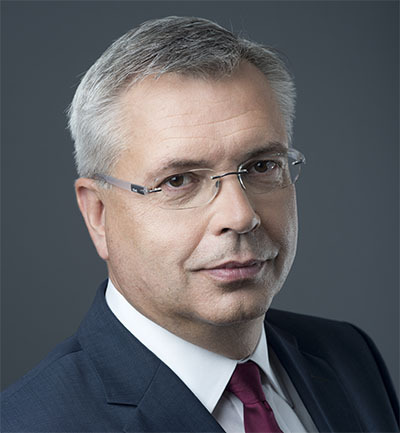 Marek has held function as the Chairman of Supervisory Board and the President of the Management Board of PKO BP S.A., Wilbo S.A., Centrum Haffnera. He was or is a member of many supervisory boards, among others: the National Investment Fund “Magna Polonia“ S.A., Member of Supervisory Board of Bank Pocztowy S.A., Nordea Bank Polska S.A., the National Deposit of Securities, PTE AEGON S.A. and Kompap S.A.
Marek works in various social and economic organizations. He is the President of the Board of the Gdańsk Business Club, an association of entrepreneurs, managers and intellectuals of the Coast, Chairman of the Council of the University of Gdańsk and founder and Chairman of the Council of the “Baltic Institute of Technology” in Gdynia, and a member of the Council of the Józef Piłsudski Family Foundation, as well as of the Józef Piłsudski Museum in Sulejówek and the National Museum in Gdańsk . He is the arbitrator of the International Court of Arbitration at the National Chamber of Maritime Economy in Gdynia. Marek is also the honorary consul of the United Kingdom of Great Britain and Northern Ireland.